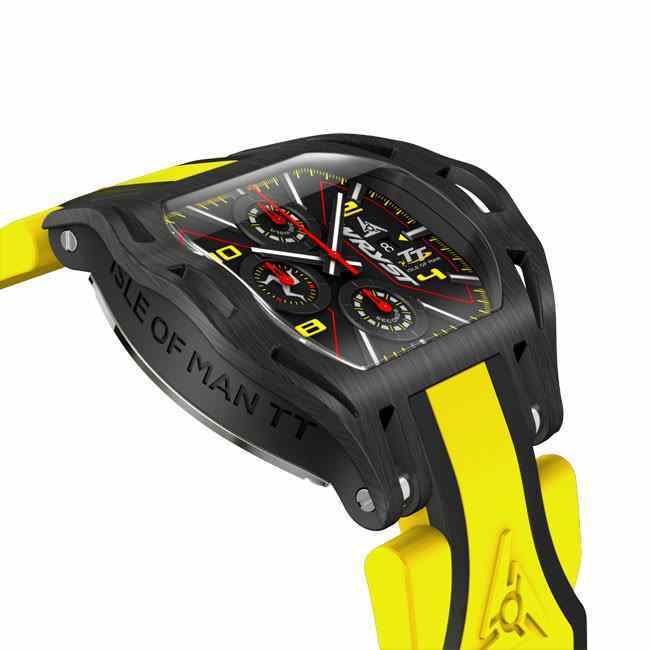 Isle of Man TT Wryst watch with a yellow bracelet. This exclusive special edition Swiss sports watch Wryst TT pay homage to the world's fastest motorsport race. The quality chronograph features the Isle of Man TT logo on the dial and the emblematic triskelion engraved on the case back. A brushed black DLC coating protects the casing of this aggressive looking Swiss watch designed for adrenaline freaks. The new Wryst Isle of Man TT watch is now available and in stock. 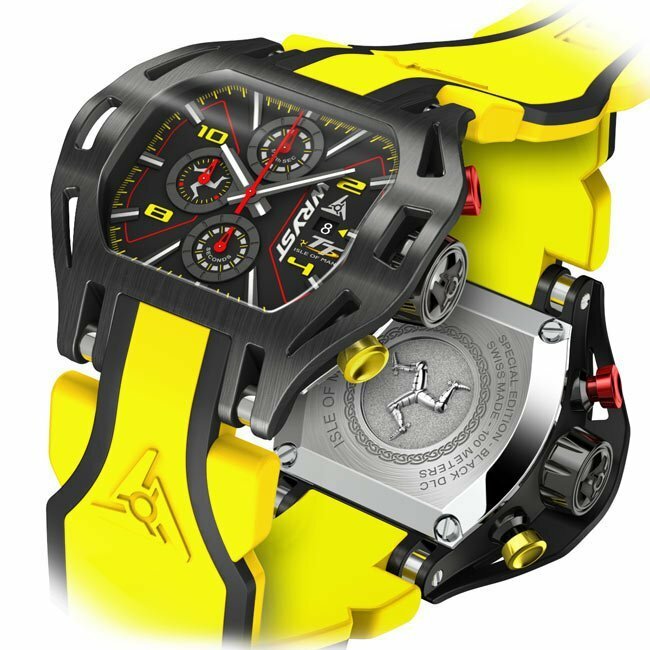 This unique sports watch inspired by the world's fastest motorsport race is truly bold and rugged. The epic Isle of Man TT takes place every year in a frenetic atmosphere for the pleasure of over 45'000 visitors. There is nothing quite like the TT races. Since 1907, Motorbikes, Superbikes and Sidecars are racing at very high speed for the fastest laps and to reach the podium. From 2018 this exclusive Wryst Isle of Man TT watch will be gifted to the racers winners on the podium and for each category. For the first time since the beginning of this exclusive partnership, the winners of the Classic TT will also be gifted an exclusive Swiss timepiece. How great are the TT Swiss sports watch? The aggressive looking racing chronograph benefit of a brushed black DLC coating, the world's strongest available. More durable and scratch-resistant than ever, the coating is also present on the crown and the square buckle. The large 50mm size watch is mounted with red and yellow anodized aluminum chronograph pushers. 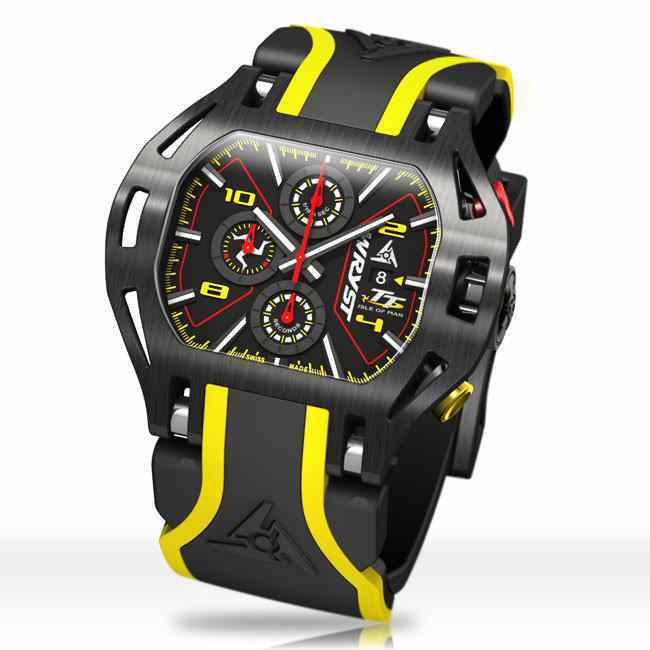 This version is fitted with a double injection bicolor bracelet in bright yellow and with black lines. 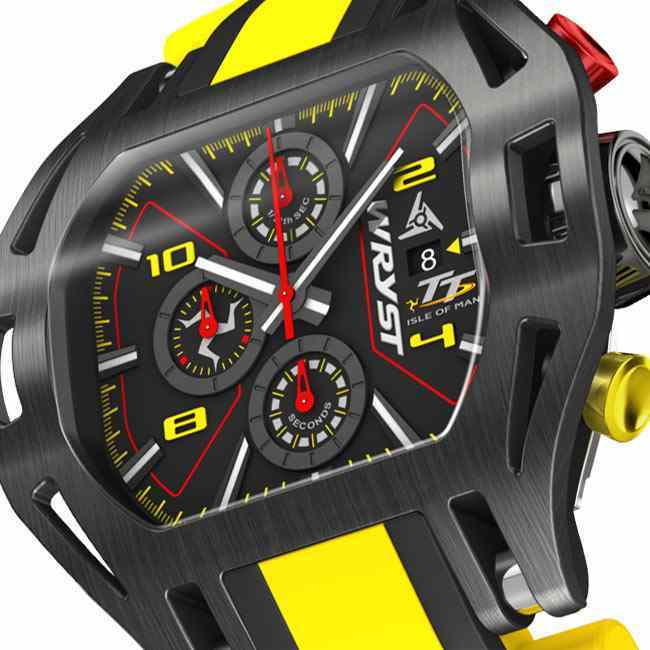 The overall Wryst TT watch matches the colors of the Isle of Man TT in black, yellow and red. The back of the watch reveals an emblematic 3D engraved Triskelion. For centuries, the island's symbol has been its ancient triskelion, three bent legs, each with a spur, joined at the thigh: The Manx Triskelion. This symbol is also present on the chronograph subdial at 9-hour position. The artwork also features a Celtic circle, a reminder of The Manx Gaelic language, one of a number of insular Celtic languages spoken in the British Isles. 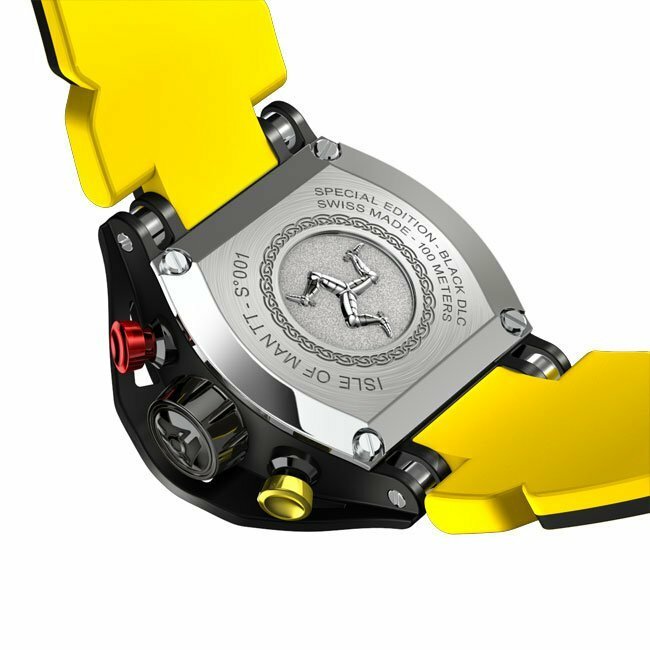 The inscriptions also include Special Edition, Black DLC, Swiss Made, 100 Meters Water-Resistance and the serial number. The aggressive looking Wryst TT luxury fashion accessory is not only bold and sturdy. The Swiss gold plated movement Ronda 3540D with 5 jewels is accurate and reliable. On the black dial feature several functions for timing races or any type of event. When activated, the chronograph 12-hour counter indicate 1/10 seconds up to 30 minutes, at 6-hour is the 30 minute counter, and 9-hour sub dial indicate up to 10 hours. There are also ADD and SPLIT functions. The long red stopwatch hand indicated the seconds. When the chronograph function is not in use the long red hand should remain at 12h and the seconds are then available in the 6-hour subdial. Should you decide to let the chronograph running at all time, the battery lifetime of your watch will be considerably reduced. Despite a chunky look, the timepiece is extremely comfortable with a large 24mm width double injection bright yellow silicone bracelet with black lines. The left of this legendary watch case is also engraved ISLE OF MAN TT. You can pre-order this Swiss sports watch today and please do not hesitate to contact us if you wish to know the availability of a particular serial number. Many of our customers are wearing their Wryst TT watch every year while visiting the Isle of Man during the first days of June, be part of the legacy. Finally, since 2012 the Swiss watch brand Wryst thrive to produce unique avant-garde reliable timekeepers like never before. You can browse other limited edition sports watches available and in stock. Note the TT watch in 45mm size only lasted for 1 year and became sold-out in the month of July 2016. 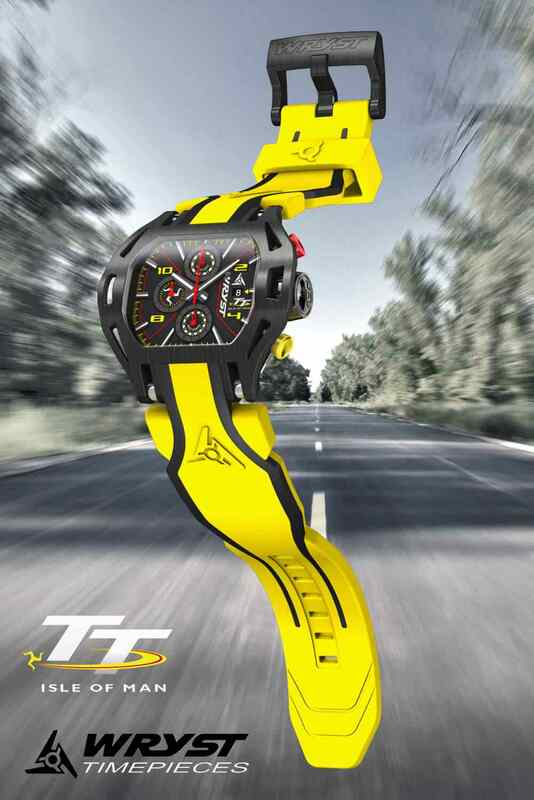 Very good looking TT watch. Feels large and well built. Very comfortable to wear which is surprising for a 50mm case size.